This is an introduction to the International Phonetic Alphabet (IPA) for English-speaking Wikipedians. Its purpose is to explain the IPA's basic principles to English speakers. IPA clearly and unambiguously indicates how a word or name actually sounds with one letter for each sound. Wikipedia uses IPA because it's the global standard used by professionals and the only system used in most schools in the world. Vowels: English orthography uses 6 vowel letters (a, e, i, o, u, y) to represent some 15 vowel sounds. While the English system is compact, it is also ambiguous. The IPA is unambiguous, representing each vowel sound with a unique letter or sequence. (See the vowel audio chart). Note that most of what in English are called "long vowels", A, E, I, O, U, are in fact combinations of two sounds, which is why they are transcribed in the IPA with two letters apiece: /eɪ/, /iː/, /aɪ/, /oʊ/, and /juː/. Because English short vowels a e i o u are closer to the Classical pronunciation (still found in Spanish and Italian) than the long vowels are, it is the short vowels which are transcribed with IPA letters which resemble the English letters a e i o u. However, they are modified to show that they aren't exactly the Classical sounds. For the a sound of cat, the Old English letter ash, ‹æ›, was resurrected: /kæt/. The e i u sounds of pet, pit, put (not putt) were originally written as capital letters, and that is sometimes still done with manual typewriters. However, small caps looked better, so they were for a time written E I U. These took more cursive forms over time, and are today written /ɛ ɪ ʊ/: pet /pɛt/, pit /pɪt/, put /pʊt/. The latter, of course, is also the short oo sound of good /ɡʊd/. The u vowel of putt or cut, is written as an upturned letter "v" e.g. cut /kʌt/. The exact pronunciation of this sound varies considerably among English dialects. The a sound in bra is written with a cursive a. Because it's long in many dialects, it's /ɑː/ in the IPA: /brɑː/. Likewise, the aw sound of law is long in many dialects, but different than the bra sound. It's written with an "open" o (just as /ɛ/ looks like an open e, since a small cap o looks just like a regular oː law /lɔː/. (Many of you might not make this distinction, in which case you can think of these vowel letters as being the same when reading the IPA.) For those of you who distinguish it, there is a third similar sound, the o of mop. This is written with the bra vowel letter rotated 180°: mop /mɒp/. (A rather unusual IPA letter, as that's an unusual vowel, not found in many languages). The vowel sound in bird is written as an upturned /ɛ/], therefore it is written as /bɜrd/. Finally, there's the slurred schwa sound found in many unstressed syllables, as at the end of sofa. This is written /ə/, a symbol used in many US dictionaries. The stressed syllable is marked with a tick: sofa /ˈsoʊfə/. Note that the letter /ə/ is never used for a stressed vowel; for words like cut, we use /ʌ/: butter /ˈbʌtər/, cuppa /ˈkʌpə/. The sound of the digraph SH is transcribed with the 'stretched' S seen in old books. It's used in its cursive form, /ʃ/, to make it easier to read, as in push /ˈpʊʃ/ and shelf /ˈʃɛlf/. There is a sound with no letter or digraph in English, though sometimes written ZH in foreign words. It's usually written si, as in vision. In the IPA, it's written with a 'stretched' Z, /ʒ/: vision /ˈvɪʒən/. As noted above, the digraph CH is a sequence of sounds, T plus SH. This may be hard for an English speaker to hear, but is obvious to a French speaker, which is why we get spellings like Tchaikovsky but also catch in English. (Adding a t to ch doesn't make any difference, because the ch already has a t sound within it.) The IPA uses the same stretched S for this sound here as anywhere else: itch /ˈɪtʃ/. Similarly, the English consonant J is a sequence with a d sound in it. For instance, in judge, adding the d doesn't affect the consonant sound, just the vowel. 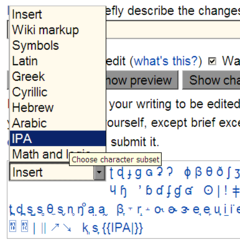 In the IPA, this is transcribed /dʒ/: jump /ˈdʒʌmp/, judge /ˈdʒʌdʒ/, or Jesus /ˈdʒiːzəs/. Finally, the IPA letter [r] is officially a trill, as in Italian and Spanish. The rather unusual English R sound is transcribed with a turned r, [ɹ]. However, since this makes no difference within English, and not all English dialects actually use the [ɹ] sound, it's very common to see English R transcribed with a plain /r/, and that's the convention used on Wikipedia. Wikipedia does not follow the usual approach of many United Kingdom dictionaries which place the final r in brackets. IPA's purposes are to 1) represent the phonetics of words (how they sound), and 2) to give samples of the phonology of a language (how the language as a whole sounds). The second purpose concerns only linguists. The first purpose concerns any interested reader, but only to a limited degree, as transcribing words into IPA does not need to be perfect or overly precise (something for fluent IPA users to consider). The word "transcribe" is used to distinguish this from normal writing or spelling, which has other purposes (such as preserving word etymologies and meaning). ^ The English digraphs ee, oo, au, ei, ai, ou, ie, eu, etc. are not used at all in the IPA, or similar combinations of two letters are used to logically represent two sounds, for example /eɪ/ for the two vowel sounds in "may", not the single vowel sound at the end of "receive ".